FIRST MOT DUE DECEMBER 15TH 2019 + FULL NISSAN SERVICE HISTORY (1st @ 9,218 miles, 2nd carried out @ 18,447 miles DECEMBER 2018)12 MONTHS AA BREAKDOWN COVER + 3 MONTHS NATIONWIDE MECHANICAL BREAKDOWN WARRANTY+ EXPERIAN HPI CHECKED + FULLY DETAILED INSIDE AND OUT. 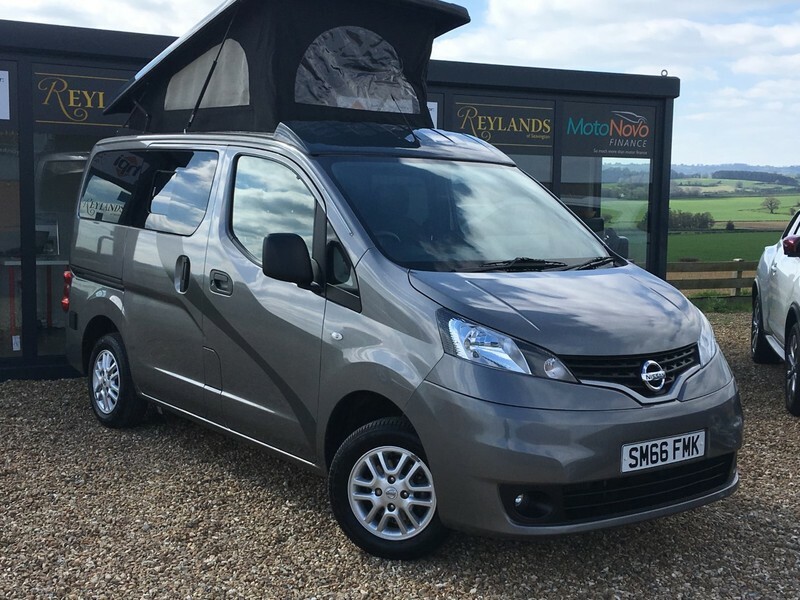 Welcome to Reyland's of Seavington, we have the pleasure of taking this fabulous NISSAN NV200 TEKNA (TOP OF THE RANGE!!) Motor Caravan finished in a light grey metallic with only 1 private Lady Owner from new and only 20,501 miles and a FULL NISSAN SERVICE HISTORY!! This Campervan is the TOP OF THE RANGE TEKNA MODEL so has a extremely high specification, including alloy wheels, SAT NAV, REVERSE CAMERA, USB connectivity, Air Conditioning, alloy wheels, body colour bumpers, remote locking, cruise control, Bluetooth hands free telephony, front fog lights, electric windows and electric mirrors. This Campervan was fully professionally built from new and also features a LARGE SPECIFACTION including passenger swivel seat, removable table, sink plus running water, gas stove (looks unused), fridge/freezer (looks unused), pop up roof with fly screens, rear seat with x2 3x3 rear seat belts, lighting, 12v sockets, USB chargers, cupboards/storage areas, leisure battery, curtains, sliding windows and sliding doors both sides. This CAMPERVAN / MOTORHOME / CAR CAMPER, is in superb condition and mostly looks unused and is in fabulous condition and will the pride of its lucky new owner. Reyland's VIEW BY APPOINTMENT ONLY. PLEASE CALL 01460 929121 To arrange a viewing or to ask any questions, We are located in Seavington, Nr Ilminster, Somerset, TA190QB.